I was brainstorming what types of super EASY dinners I might be in the mood to make when arriving back home right at 5:00 pm on a school night after a busy weekend out of town. With all the unpacking of dirty clothes and packing of school lunches ahead of us, I knew dinner had to be quick or I’d be tempted to eat out (not my first choice after eating out so much while away). So, the winning home cooked dinner turned out to be Simple Seafood (from my first cookbook – I love how fish takes no time at all to cook!) with a side of the Sheet Pan Brussels Sprouts and Potatoes that I am sharing below. Roasting a variety of different produce together is a great way to achieve an almost one-dish dinner with hardly any dirty dishes waiting for you when you’re done! 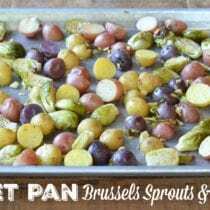 Place the sprouts, potatoes, and garlic on a half sheet pan. In a small jar with a tight-fitting lid, shake together the oil, vinegar, salt, and pepper until emulsified. Pour over the veggies and toss together with your hands until evenly combined. Bake until tender when pierced with a fork, 25 - 30 minutes. Serve warm. Dinner? This is a side dish, at best and one that my kids wouldn’t eat. What else would you serve with this? The article above says that she served this with her Simple Seafood fish recipe, since fish is so easy to cook. guess it is a hint to buy her cookbook. I have seen magazine articles where they add a pork roast to the sheet pan for a complete dinner. The smaller ones cook quickly and you could add two for a large family or a bunch of boneless pork chops for a quick total dinner. 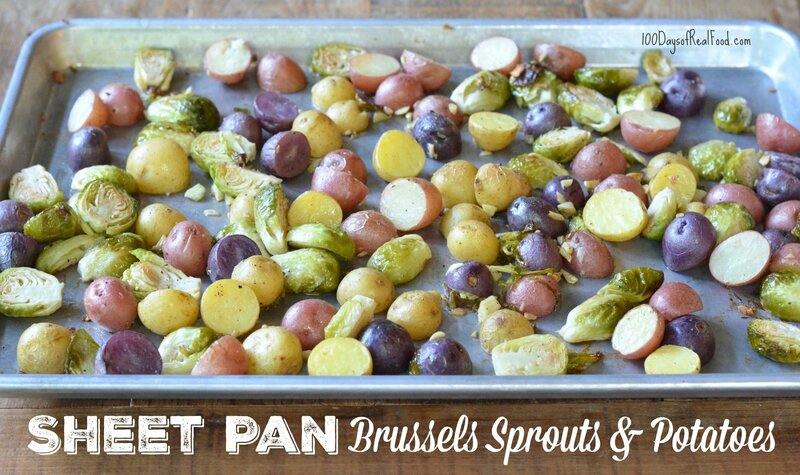 I completely agree with you, perhaps the title of this should say “side sheet pan brussel spouts and potatoes”. I personally wouldn’t have fish with this, simply because if I am using my oven, I would bake chicken along with this side. I am also having difficulty thinking that many children would enjoy this (another reason for picking chicken) but when all put together I think it’s a great meal for adults :) thank you.. If I were trying to make something easy, I might make something like this with either grilled chicken or a rotisserie chicken from the grocery store, though those are probably verboten around here. My husband and I would enjoy this side, but the kids, not so much. I eventually grew up and started to like vegetables and I am sure my kids will too. While this side dish looks delicious to me and my family, I have to concur that it may not be considered “dinner” for most (as the email link suggests). Perhaps you could link to the Simple Seafood recipe you reference above. A search of your website does not list it under the recipe tab. Looks delicious! Our kids love potatoes and are learning to like sprouts. Paired with crockpot chicken, looks like a winner! Never thought of adding the vinegar before. Thanks! I couldn’t find the Simple Seafood recipe you reference or any link at all. Can you provide that please? Thanks. Hi there. That particular recipe is not on the blog but in her first cookbook. Here are links to several others, however: https://www.100daysofrealfood.com/?s=fish. I will have to give this a try. My kids will love this! Bonus – they will love getting their hands messy mixing the potatoes & Brussels sprouts with the oil & vinegar. Beets would be a good addition to this as well. Buy her cookbook. It’s one of the best out there. I use it all the time. I really need some help in getting my kids on board with eating better. I am doing some of the real food, but my kids are really fighting it. I made the delicious tomato sauce for pizza, I thought it was great on my pizza. well, the kids did not like. Keep feeding it to them??? Don’t know. Eating healthy is worth the fight. I say keep up the good work. My kids (both age 5 years) know how much better they feel when they eat well. I make the connection with them every time we slip and lean towards processed food. We all end up feeling horrible and they usually tell me we should stay away from junk. Kids are so amazingly resilient. My kids (both age 5 years) LOVE roasted Brussel sprouts. I have not tried it with the vinegar though; we use olive oil and salt. I do agree that this is a side dish for sure, but fish would be a super quick protein. Looks delish, but I find prepping Brussels sprouts to be a little tedious and not quick at all. The oil and vinegar sauce looks good. Having fish tonight, so will try! I make this in large batches and we eat as a meal. The thought that veggies must be paired with a meat to complete a dinner really doesn’t have to be the case. It may be preferred for some, but often times with enough veggies, there’s no need for the meat. The fun part is you get to be creative, open-minded to different types of meals. Thanks for a great recipe. My daughter loves this meal. I completely agree! Great recipe. This does look delicious! I bet it would be good with some Parmesan cheese grated on top! !